"Henry Weed Covert died yesterday at his home at 270 Midland Avenue, Montclair. He was born in Albany in 1824 and later came to New York and founded the H. W. Covert Company, manufacturers of fireplace dampers." - quoted from the New York Times, 27 May 1914, p. 11. "Stanley Smith Covert, manufacturer of building specialties, died here [Larchmont, N.Y.] today [Jan. 29] at his home, 76 Wendt Avenue. Mr. Covert had collapsed earlier in the day while about to board a train for New York, where he had offices at 229 East Thirty-seventh Street. He is survived by his widow and by two sons, James D. and Burton Covert." - quoted from the New York Times, 30 Jaunary 1934, p. 19. Henry Weed Covert (1824-1914) was an inventor and manufacturer who patented his first invention, a "Permutation Lock," in 1857, Patent No. 18,228, when he lived in Rochester, N. Y. A year later his "Cam for Throwing Bolt in Locks," Patent No. 21,655, was also issued when he lived in Rochester. He seems to have moved to New York City in the 1870s. The U. S. Census of 1870 records him living in Rochester with his family that included Stanley Covert, age 8. Henry Covert's occupation in 1870 was locksmith. His name is included in Brooklyn city directories beginning in 1879. These listings describe him as a lock manufacturer, machinist and inventor. Covert entries in the Brooklyn directories included both Henry W. Covert and his son, Stanley S. Covert. They shared residence in Brooklyn from 1880 through 1893. In 1876 Henry W. Covert of the city of New York was issued a Patent for "Improvement in Paper-Feeding Machines," Patent No. 182,105, dated 12 Sept. 1876, application filed 3 June 1876. In the 1880 U. S. Census Henry W. Covert, age 56, lived at 24 Fourth Place, Brooklyn, NY, and identified himself as a safe manufacturer. Living with him at the time was a son, Stanley S. Covert, age 18, an architect. In the 1890s Covert left Brooklyn and moved to Waterford in upstate New York (on the Hudson River, north of Troy, NY). From this time forward Covert concentrated on the manufacture of fireplaces and equipment like andirons, etc. used with fireplaces. City directory entries show that Henry Covert lived in Waterford and had a factory there from around 1895. At the time of the 1900 U. S. Census Covert lived on First St. in Waterford. This advertisement from the Troy, N. Y., city directory in 1899 cites the address of Covert's New York City offices on West Broadway and the factory on First St. in Waterford. Sweet's Indexed Catalogue of Building Construction for the Year 1906, published by the Architectural Record Co., contains a description of Covert products and services. This work is available on Google Books. Covert's New York office address was 266 Greenwich St. The Covert entry in Sweet’s Architectural Catalogue, 1917, reads, The H. W. Covert Company, Manufacturers of Fireplace Specialties, 351 Lexington Avenue, New York, N. Y. Products: Covert Patent Iron Fireplace Throat and Damper. Also, Iron Coal Windows; Clean-out Doors; Ash Dumps; Iron Plinths for Porch Columns; Texture Brick Fireplaces complete. The construction of a Covert fireplace is illustrated. The Covert entry in Sweet’s Architectural Catalogues, 1933, reads as follows: The H. W. Covert Company / Manufacturers of Fireplace Specialties / 229 East 37th Street, New York, N. Y. Products: Covert Patent Fireplace Dampers and Smoke Chambers. Also Cleanout Doors, Ash Dumps, Franklin Fireplaces, Coalhole Covers, Trap Pit Covers, Wall Safes, etc. A Covert trademark for Fireplace Dampers is shown. 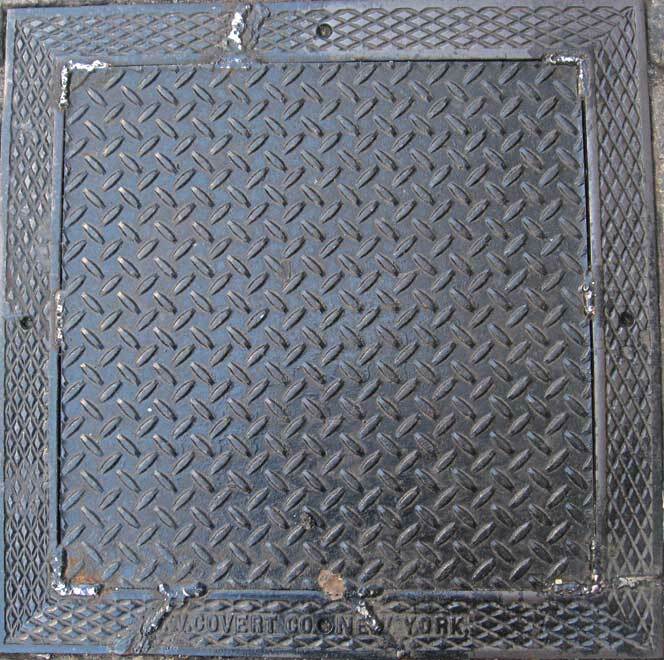 Sweet's, 1933, also shows the use of Covert Anti-clog Floor Drains. Stanley Smith Covert (1861-1934) succeeded his father as president of H. W. Covert after his father's death in 1914. The business maintained New York City offices from approx. 1899 to 1954. These advertisements show the business located at 266 Greenwich St. in 1906, 168 Duane St. in 1911, 71 Murray St. in 1913, 351 Lexington Ave. in 1920, 137 E. 46th St. in 1926, and 339 E. 48th St. in 1942. Covert sidewalk lids abound in New York city. All that I have seen are of uniform shape and size and carry the inscription "H. W. COVERT CO. NEW YORK."